Immortal (2013) is a 2-part performance that I directed in conjunction with Al-Mutanabbi Street Starts Here, an international coalition and traveling exhibition of artist books created in response to a 2007 targeted car bombing on Al-Mutanabbi Street, a legendary street of booksellers and locus of intellectual and cultural activity in Baghdad, Iraq. The performances memorialized 51 lraqi victims through a collective meditation on each of their names at the Cambridge Arts Council Gallery, the site for a series of artist book installations and related programs. I worked with four artists, each of whom I assigned a specific action. By the end of the first performance, each Iraqi’s name had been inscribed in the blank pages of an accordion book by performer Ghada Masri as I extended the book to its full 12-foot length. During the second performance the inscribed names underwent a material and metaphysical transformation resulting in a quantity of paper yarn on a spindle that was later rolled in a ball and tied in a special cloth wrapper. The visible side of the wrapper displays a poem I wrote (translated from English to Arabic and inscribed by Ghada Masri). 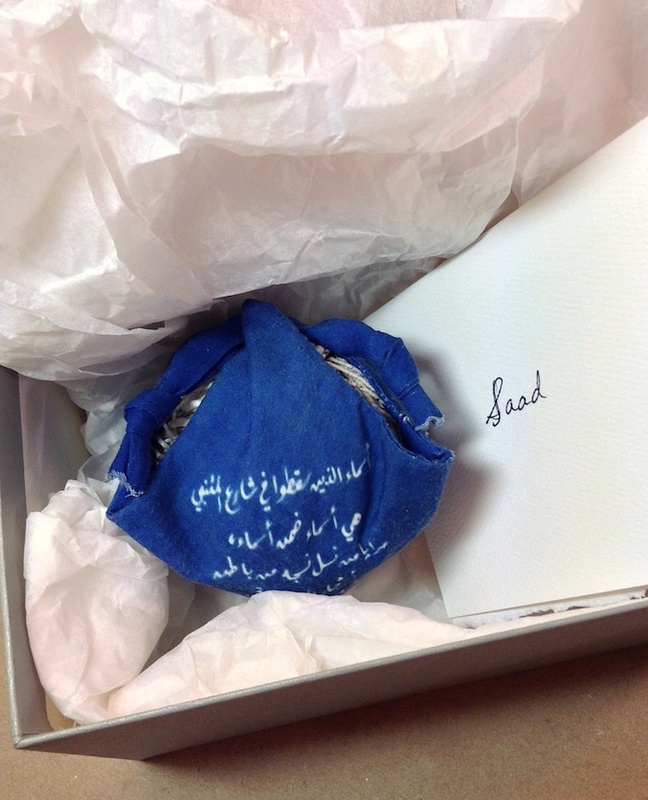 The inner part of the wrapper is imprinted with the 51 Iraqi names.